It's now been over a year since I first explained the horrible state of Blu-ray audio on the PC. I'm not talking about music discs, but rather the audio component of any Blu-ray movie. It boils down to this: without an expensive sound card it's impossible to send compressed Dolby TrueHD or DTS-HD Master Audio streams from your HTPC to an AV receiver or pre-processor. Thankfully AMD, Intel and later NVIDIA gave us a stopgap solution that allowed HTPCs, when equipped with the right IGP/GPU, to decode those high-definition audio streams and send them uncompressed over HDMI. The feature is commonly known as 8-channel LPCM support and without it all high end HTPC users would be forced into spending another $150 - $250 on a sound card like the Auzentech HomeTheater HD I just recently reviewed. For a while I'd heard that ATI was dropping 8-channel LPCM support from RV870 because of cost issues. Thankfully, those rumors turned out to be completely untrue. 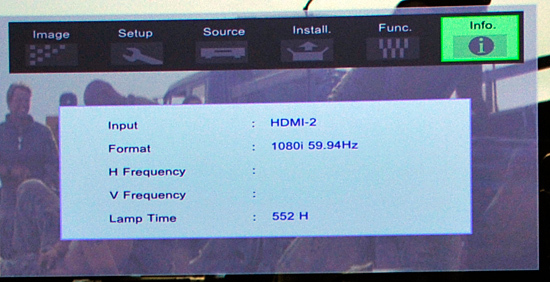 Not only does the Radeon HD 5870 support 8-channel LPCM output over HDMI like its predecessor, but it can now also bitstream Dolby TrueHD and DTS-HD MA. It is the first and only video card to be able to do this, but I expect others to follow over the next year. The Radeon HD 5870 is first and foremost a card for gamers, so unless you're building a dual-purpose HTPC, this isn't the one you're going to want to use. 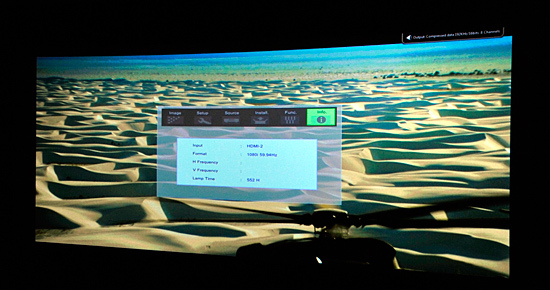 If you can wait, the smaller derivatives of the RV870 core will also have bitstreaming support for TrueHD/DTS-HD MA. If you can't and have a deep enough HTPC case, the 5870 will work. In addition to full bitstreaming support, the 5870 also features ATI's UVD2 (Universal Video Decoder). The engine allows for complete hardware offload of all H.264, MPEG-2 and VC1 decoding. There haven't been many changes to the UVD2 engine; you can still run all of the color adjusting post-processing effects and accelerate a maximum of two 1080p streams at the same time. ATI claims that the GPU now supports Blu-ray playback/acceleration in Aero mode, but I found that in my testing the UI still defaulted to basic mode. No HDPC errors, no strange player issues, nothing - it just worked. 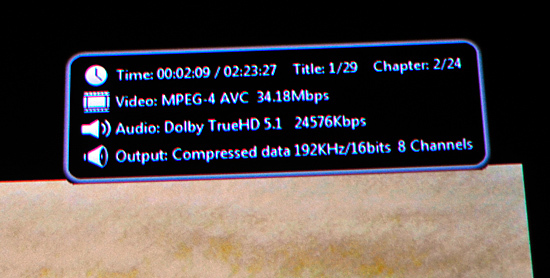 Next up was Dolby TrueHD. I tried American History X first but the best I could get out of it was Dolby Digital. I swapped in Transformers and found the same. This ended up being an issue with the early PowerDVD 9 build, similar to issues with the version of the player needed for the Auzentech HomeTheater HD. Switching audio output modes a couple of times seemed to fix the problem, I now had both DTS-HD MA and Dolby TrueHD bitstreaming from the Radeon HD 5870 to my receiver. 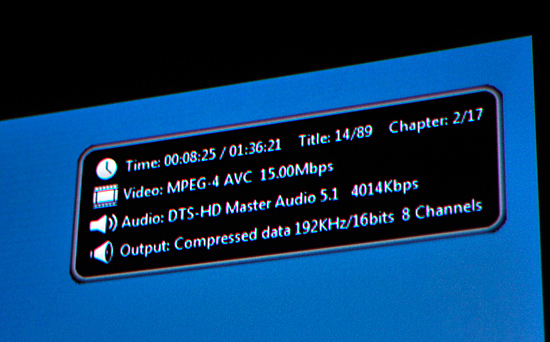 One strange artifact during my testing was the 5870 apparently delivered 1080i output to my JVC RS2 projector. I'm not exactly sure what went wrong here as 1080p wasn't an issue on any other display I used. I ran out of time before I could figure out the cause of the problem but I expect it's an early compatibility issue. I can't begin to express how relieving it is to finally have GPUs that implement a protected audio path capable of handling these overly encrypted audio streams. Within a year everything from high end GPUs to chipsets with integrated graphics will have this functionality. Still no 3rd option for hd audio. YES, WORKING PERFECT FOR ME...TRY THIS: PLAY THE BLUE-RAY MOVIE THEN GO TO SETTING ON POWERDVD AND CHARGES TO THE 3ER OPTION FOR HD SOUND. What good does it do to launch this, if there are still none for sale a month later? 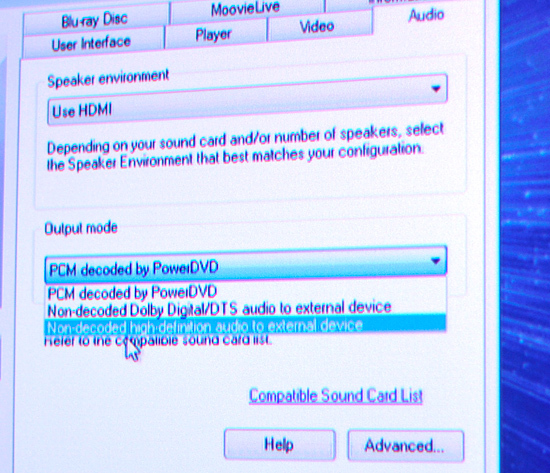 "As of today, new PowerDVD 9 Ultra customers will receive build 2320, which includes support for HDMI bitstreaming of undecoded (full quality) audio with ATI Radeon 5000 series graphics cards, and the Auzentech X-Fi Hometheater HD sound card. An update patch for current owners of PowerDVD 9 Ultra is scheduled to be available next Friday (11/27). Yes... we read these forums regularly. Feedback is forwarded to the appropriate people. These forums aren't the best way for us to provide customer support, so if you have an issue, please open a support ticket through our website. We can't always comment on new developments... or at least we like to wait until we have a definite answer. I know everyone noticed the reviews for the ATI Radeon 5000 series graphics cards, where certain reviewers were using a pre-release version of PowerDVD 9 to demonstrate HDMI bitstreaming of Blu-ray audio. Support for this feature will be in the next PowerDVD update (patch), which will be available later this month. I don't have a firm date on this, but we're trying to expedite it. Please keep in mind that each of our regular updates includes fixes for new BD titles and new (or forthcoming) hardware / drivers across the PC ecosystem, and so the feature you are anxiously waiting for isn't the only thing that we need to include in the update. Of course, each update has to go through a full quality assurance testing procedure, to make sure that none of the changes introduced any new issues. So... sorry for going quiet on you... but I and others read every post in this thread and other relevant threads, following up as needed (in some cases, directly through private messages on these forums).